When this graphic novel showed up on my doorstep, I was immediately intrigued. This middle grade science fiction adventure is adorable and the art is beautiful! Although I'm definitely not the intended audience, I had a lot of fun and read it during an afternoon read-a-thon. 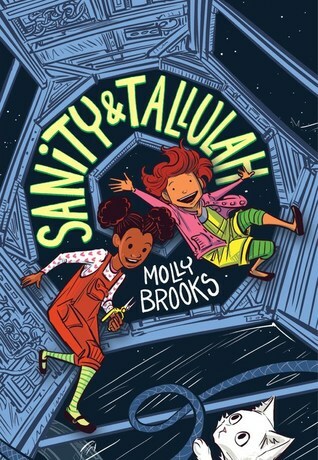 Sanity and Tallulah are friends on board a space station where they live with their parents and get in all kinds of trouble together. Sanity is a scientist and, sneaking into a lab when she really shouldn't be working alone, creates an experimental kitty named Princess, Sparkle, Destroyer of Worlds. The kitten also happens to have three heads and is promptly named a monster by those in charge when she escapes. Of course, the two girls take it upon themselves to find her before the people hunting her down do. I loved Sanity, Tallulah, and the three headed kitten! The girls are smart, brave, and (of course) a lot mischievous. This story actually had quite a bit going on to be such a short graphic novel. There's adventure and mystery and it even gets a little scary (although it stays lighthearted). While Sanity and Tallulah are searching for their cat, trying to figure out what's happening within the space station, and save it, there are other adventures happening in other parts of space. I hope this is a series, because I'd definitely love to see more of what goes on in this universe! One of my favorite things about this book was that it centered around two girls who loved the sciences and were encouraged by their scientific community to learn. I think it's so important for young girls to read about characters like this! I honestly don't recall any books I read growing up with girl scientists... I've already got this wrapped for my pre-teen niece!